Brotherwise Games made their debut in the board game market with the release of Boss Monster: The Dungeon Building Card Game in 2013. Since then they have been a huge supporter of various members and events in the board game community. They are a small company with big values that understand that a little bit can go a long way. There's no doubt I have been dying to play one of their newer releases, Unearth. Place all the stone tiles in the cloth bag. Shuffle the Delver Deck and deal two cards to each player. Shuffle the Ruins Deck and deal 1 card face down to each player. The player may look at their card. Remove the top five cards from the Ruins Deck and place them in the game box without looking at them. Shuffle the End of Age Deck. Randomly choose one card and place it on the bottom of the Ruins Deck. Put the rest of the cards back in the box without looking at them. Reveal five Ruins cards and place them face up in the center of the table. Randomly draw and place a number of stone tiles on each Ruin aa indicated by the icon in the bottom right corner of each card. Shuffle the Named Wonders deck and draw cards equal to the number of players plus two. Place them on the table with their corresponding tokens on top of the card. Put the rest of the Named Wonders cards and tokens back in the box. Place the Greater Wonder and Lesser Wonder cards on the table. Shuffle the Lesser Wonder and Greater Wonder tokens and stack them face down on their corresponding cards. Each Player takes a set of dice of one color. Roll to see who goes first. Play proceeds clockwise. Delver Phase: This phase is optional. You may play any number of Delver Cards from your hand. Delver Cards resolve in the order they are played and then discarded. Excavation Phase: You must roll one dice from your pool and place it on a Ruins Card in the center of the table. You must declare which die you will roll and which Ruin you will place your die on before it is rolled. Whenever a die is rolled, rerolled, or a card is played, check to see if the total of all the dice on any ruins are greater than or equal to the claim value of the Ruin. The Ruin is claimed by the player with the highest individual die result and added face up to their collection. The players that did not claim the Ruin draw cards from the Delver Deck equal to the number of dice they had on the Ruin. Building Wonders: Once a player has completed a hexagonal ring of Stones with an empty space in the center, they get to fill the empty space by building a Wonder. If the stones are all the same color, fill the empty space with a randomly selected Greater Wonder face down. If the stones contain more than one color, place a Lesser Wonder in the empty space face down. The Named Wonders in play may be placed instead of a Greater or Lesser Wonder, but require a specific selection of Stones indicated om the card. After all of the Ruins Cards have been flipped up reveal the End of Age Card the same way you would reveal the next Ruin Card and do what it says. The game ends when all ruins on the table have been claimed. Ruins Cards score points based on how many matching Ruins you have. Players who have one of each of the 5 colors of Ruins scores 5 points. Players score points indicated on their Lesser, Greater and Named Wonders. Players who have built three or more wonders score 5 points. The player with the most points wins. In case of a tie, the player with the most Ruins of the highest claim value wins. For the most part the rule book is pretty well written. We did make some minor mistakes during our first set up by but were quickly able to get it sorted out. If you take the time to learn your game components before your first set up, you shouldn't have any problems. The rule book does list the components but I would've liked to see images of each component as well. There is an FAQ which came i handy a few times during the game when we questioned how some cards interacted with each other. There's no doubt that the quality of the components in this game are outstanding. The art is stunning and the dice are quite large. As far as game play goes, the game is incredibly easy to both teach and learn. 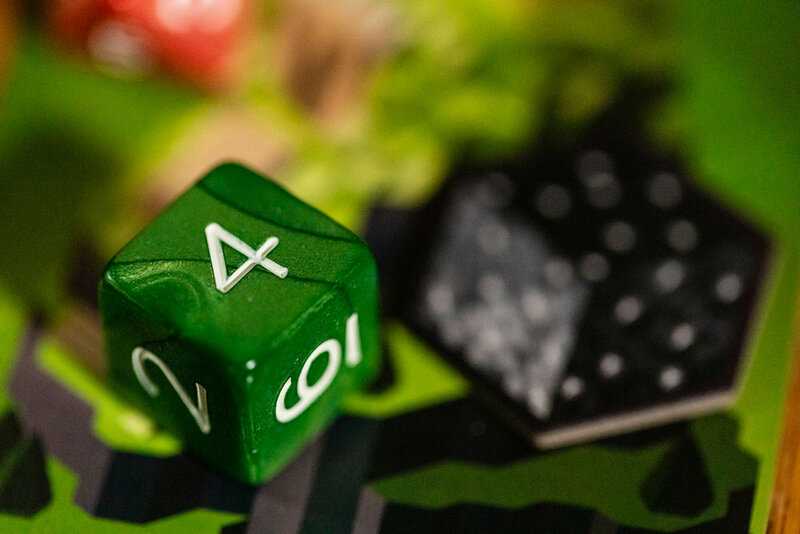 Even though there is some luck needed to play the game there are still plenty of decisions for you to make (playing delver cards, what card to roll for or which dice to use). I really like the fact that the game never punishes you. If you roll low you get a stone. If you roll high you might win a ruin. If you don't win the ruin you get to draw cards. There really is no such thing as a "bad" turn which is quite impressive for a dice game. Replayability seems okay with a variety of different wonders and end of age cards. 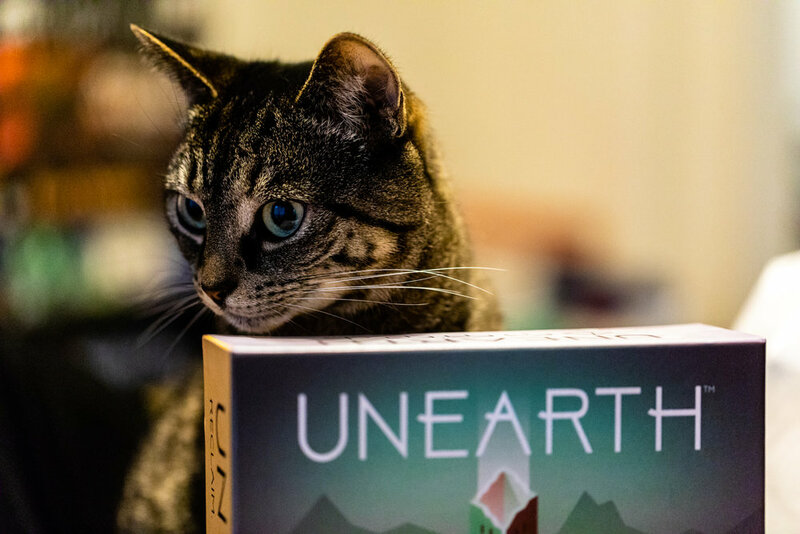 I recommend Unearth for groups looking for something on the lighter side. It works great at 2, 3 and 4 players. It would also be a great game to play with the family as long as the kids are old enough to read. Have you played any games by Brotherwise? Tell us your favourite in the comments below.